Introduced by Marilyn Miglin in 1980 PHEROMONE is classified as a luxurious greens fragrance. 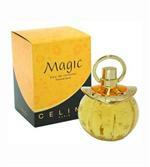 This perfume has a blend of essential oils of light and pure white flowers. It is recommended for romantic wear.